Feel the amazing comfort of the Feather soft Marshmallow reversable oversized throw,it is the Ultimate soft and comfort Reversible oversized throws. 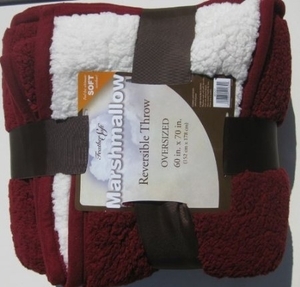 Cuddle up under this 60 x 70 inches 100% polyester feather soft marshmallow throw while watching your favorite movie. This feather soft marshmallow reversible throw is the ultimate in warmth and comfort in any home.